This leg was mostly 55-60 MPH non-limited-access highway. I stopped briefly at the Richmond WalMart, but just long enough to scout out the precise Lexington stop. I did pick up 1 kWh ($0.21) while there. 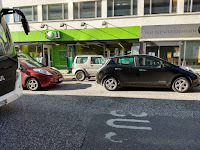 I discovered that not all the downtown ChargePoint stations in Lexington were on PlugShare, so I just added the B&B Cannonball 6 Theater on PlugShare. McDonald's is 2 blocks away and has WiFi. I'm staying here a bit longer than I need to since it's more comfortable than I anticipate the I-70 Hospital in Sweet Springs to be. More back roads travel at 55-60 MPH. The hospital itself has just a waiting room and a rest room, so I had to walk across the highway for a Casey's. At this point, it was getting hot enough that I needed to run on the car's A/C. I charged about 7 kWh and then kept rolling. I made quick stop here to possibly charge, but the dealer's own cars were ICEing (blocking with internal combustion engine) cars. I could have walked in and asked them to move one, but looking at my battery, I had enough power to keep going. This is the dealer where I leased the LEAF, but the salesman who leased it to me is no longer with the dealership. The EV plug is in a lower parking lot, but all the spots were ICEd. Fortunately, the cord reaches to the upper parking lot. I need a significant charge from here to get to the Jonesburg Garden Campground (66 miles) and/or Wentzville (91 miles). So I'll be here a while. I had thought of catching a movie, but there isn't much that interests me. So far, I've set up camp in the Joe Machens service waiting area. A/C, free WiFi, free drinks and a restroom. It's all good. 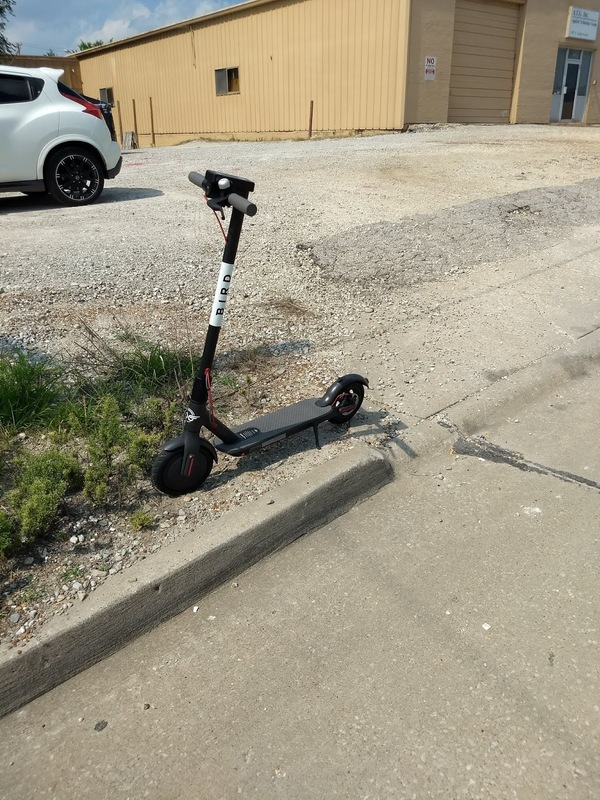 I had downloaded the Bird scooter app some time ago to try them out in Kansas City, but somehow I was never able to find the time. On a lark, I decided to fire up the app in the dealership and, lo and behold, this guy on the right popped up on the "radar". 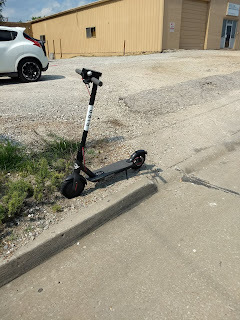 With nothing but time, I gave it a whirl and rode it to a nearby McDonald's to cool off with a drink and a snack. If you feel safe riding one of these, it's nice solution for the "last mile" needed for EV charging and getting around. Columbia ended up being one of the longest stops simply because I wasn't sure how reliable the campground charging would be. Therefore, I charged for a full 3 hours at Joe Machens Nissan. 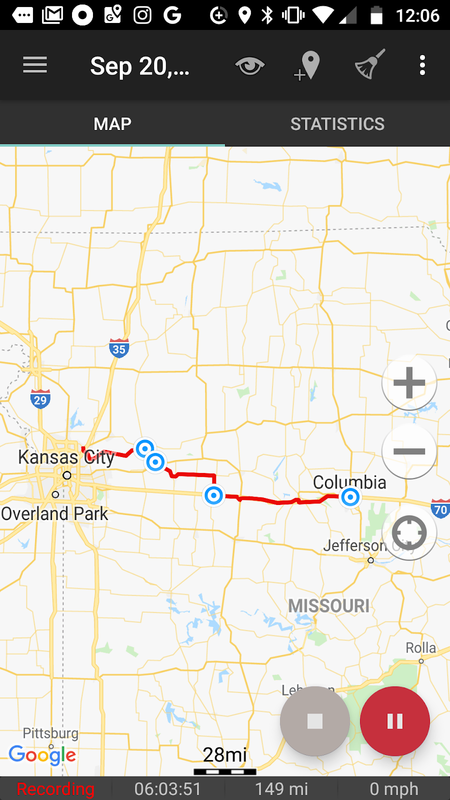 Leaving Columbia, I mostly drove byways dipping south of I-70 through Fulton. I had originally considered stopping in at Callaway Chrysler for a quick charge, but once I passed through Fulton, my power consumption was moderate a 50-55 MPH on the backroads and I felt I needed to keep moving. 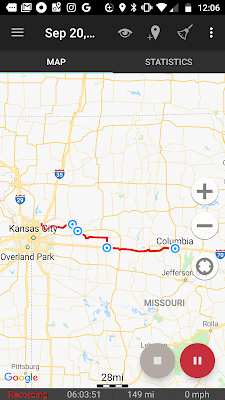 Google Maps did a nice job of keeping me close to I-70 and selected the correct access roads, sometimes crossing me over when either the north or south access road abruptly ended on the other side. 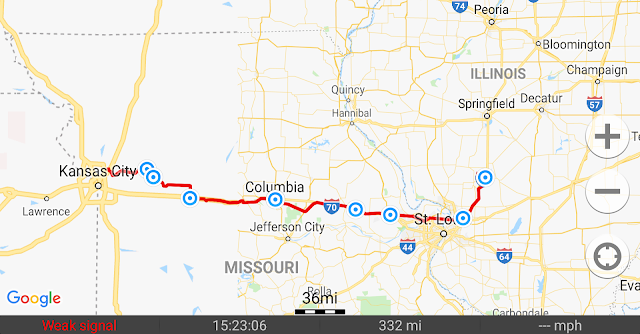 Google did try to take me far off I-70 a few times, but I simply hopped on I-70 and kept the speed at 65 MPH or so since traffic was light. Although using an RV Park 50 amp plug was in theory straight-forward, I had never done this before. Therefore, I made sure I had enough charge to limp to the St. Louis outskirts if needed. I need not have feared and plugging in my JuiceBox charger was as easy as plugging in at home. Although the charge of $5 per hour is a bit steep compared to the power you are getting, it's a valuable service and I hope more campgrounds realize the potential of their unoccupied 50 amp plugs. I only stayed for about 1 hour since the next stop was less than 30 miles away. Being near a big city like St. Louis has advantages. For me, it meant DC Quick Chargers. St. Louis has a reasonable array of EVGo DCQCs which allow me to pick up nearly a full charge in 30 minutes. Wentzville is the furthest west of these. Nearly precisely at 6:45 PM, I was rolling again. The only downside to these other than the cost of over $10 for occasional users without a charging plan is that quick charging generates a lot of heat. 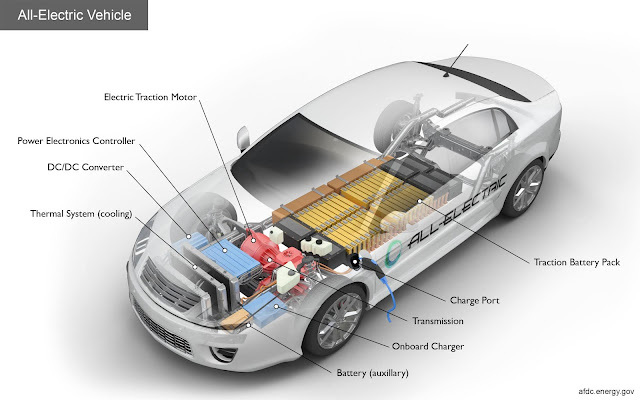 Although battery charging is fairly efficient, because of the high power input of 50 KW, even an estimated 5% loss means the battery accumulates 2.5 KW (8,500 Btu) rather quickly. 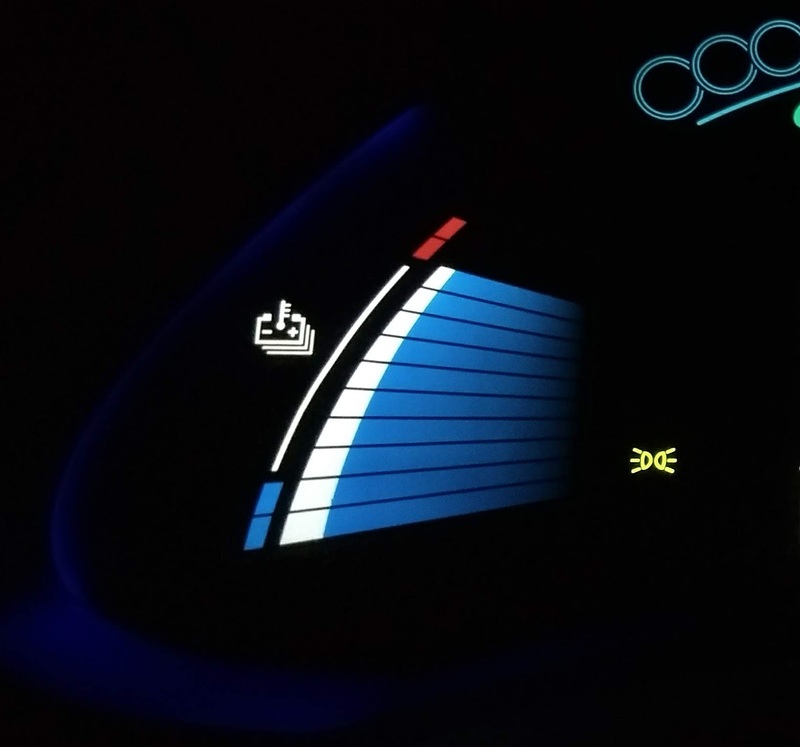 Since Nissan elected not to liquid cool and thermally manage the LEAF batteries, that's a lot of heat soak. My battery went from 8 out of 12 heat bars to 11, which is already in the "red" zone. I knew I had 2 quick charges planned, so I hoped that hitting heat red line wouldn't slow the charge rate. Back to the bright side of quick charging, I knew with another quick charge in Edwardsville, IL coming up, I could be a bit less careful about consumption. Since the day was wearing on, it was time for some 65-70 MPH travel along I-70. As it turns out, the car is more efficient on the highway than I had anticipated. This was to be the last charge of the day before reaching my intended hotel destination of Litchfield, IL. Another 30 minute and $11 charge added plenty of juice for the short jaunt to Litchfield. As expected, the battery temperature gauge crept up to 11 out of 12 bars again after dropping to 10 during the drive. At least it didn't max out at 12. I had scoped out my hotel near another charging spot for a possible overnight or early morning charge. The battery still had nearly 50% state of charge upon arrival. Nonetheless, I went ahead and plugged into the Level 2 charger, then walked to the adjacent hotel. 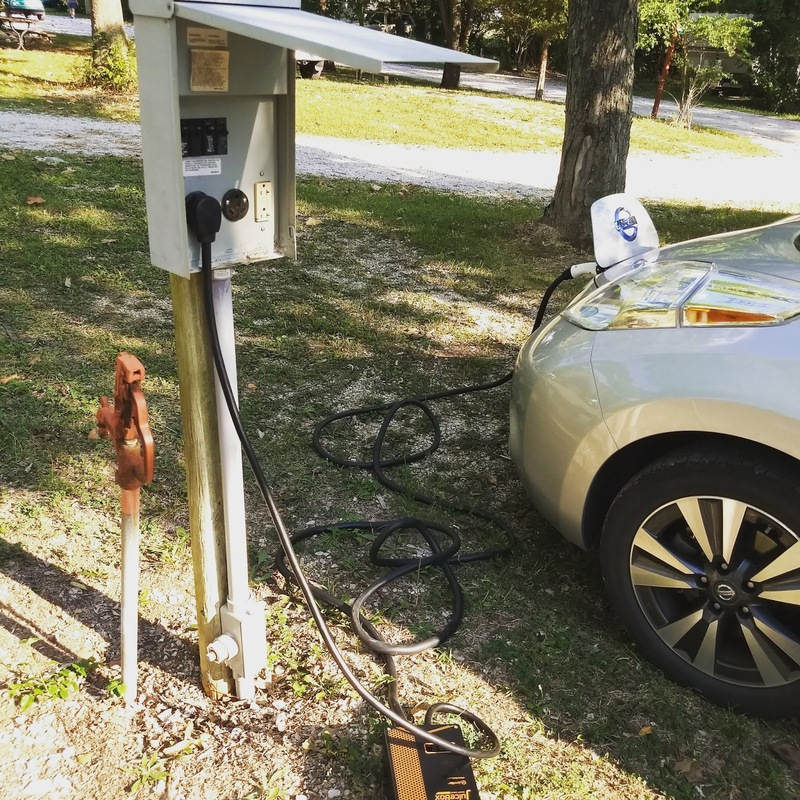 Not wanting the car to sit with 100% charge in the heat, I walked out later in the evening to unplug and move the car with an 80% charge. My plan is to top it up to 100% in the morning after it has cooled and when I will be consuming that top 20% rather quickly when I hop on the highway. Overall, the day went almost perfectly as planned. This is a testament to the PlugShare trip planner, but also some luck that every single charger worked as expected. Any one of those could have been on the fritz or been in use by others, thereby throwing the time table off or needing to look for alternative solutions. Miles: 332 (GPS tool; the odometer said 223). The discrepancy is likely my movement with my phone during charging stops but without the car.